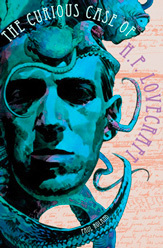 An expansive and detailed account of Howard Phillips Lovecraft from author and writer Paul Roland, this incredibly readable biography covers not just the facts and events in the life of this master of the weird tale, but also includes a detailed personal analysis of what made Lovecraft the man he was and thus, the basis or foundation from which his writing sprang. The illuminating chapters on Lovecraft's early years convincingly paint a picture of a neurotic, scholarly yet curiously unworldly and reclusive individual which, Roland posits, could be evidence of the presence of Asperger's Syndrome. It's a fascinating and well argued theory. Certainly, it is difficult not to see the linage between Lovecraft's uniquely dark, troubled visionary writing and his difficult upbringing and distinct personal attributes. Roland ably describes how the writer responded to the tragedy and trials of his early years and his adulthood; you get a genuine and sympathetic sense of Lovecraft as he was. Indeed, Roland's writing envelopes the reader in Lovecraft's world. We empathise with this ungainly and repressed young man yet Roland is no apologist; he tackles head on and decries Lovecraft's evident racism and prejudice. Insightful and in depth this book sheds significant light on Lovecraft the person and consequently therefore, as is suggested, his work too; such is the symbiotic nature of the man and his writing. This is not to suggest that Roland presents solely a superb and detailed bio, he also takes each Lovecraft tale and piece of writing and examines their worth, origins and relation to the writer's own characteristics and beliefs. This gives the book a rounded, holistic viewpoint that truly brings the tales to life and breathes new insight into their inspirations. One leaves the pages with a genuine sense of the philosophy, fears and perspectives that shaped these now classic stories. A useful appendix examining the modern glut of Lovecraftian media, from music inspired by his writing to graphic novels and PC games, is an interesting take on a writer who was barely recognised in his lifetime. There are also plentiful archive photographs of Lovecraft with his family in his New England home and with the small group of friends and fellow writers he associated with. Indeed the book is a lovingly put together package all round, from Sean Philip's evocative cover art to the shadow portraits that frame each new chapter. A must for Lovecraft aficionados, this book is clearly written by a fellow fan. A work of many years in the making this is a intensely researched, masterful and essential biography. Lovecraft's own correspondence is highly referenced as is his wife's memoirs.Hard to put down and eminently approachable, Roland's writing manages to be both highly accessible and yet also deeply detailed. In short, if you like Lovecraft you need this book.